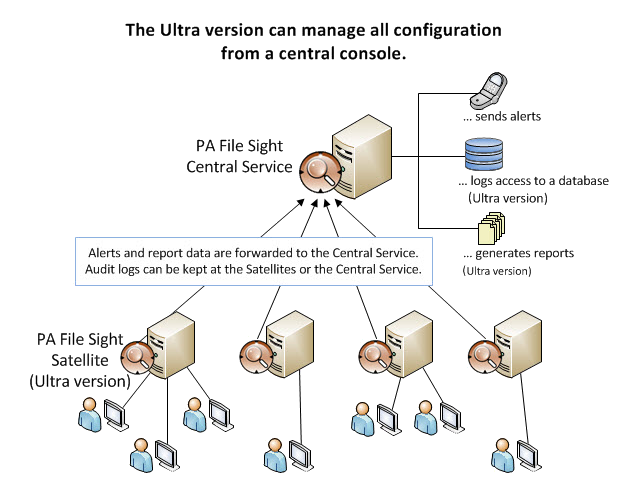 PA File Sight can monitor the server it's installed on. It can also monitor other servers on the LAN by installing a Satellite Monitoring Service on them. The Satellite will do the monitoring at the remote location and report statistics and status information back to the Central Monitoring Service as shown in the image below. The Satellite is normally installed on servers on the local LAN, but it can also be installed on servers across firewalls (including across the Internet) as long as a single incoming port is opened to the Central Monitioring Service (so the Satellite can make a secure HTTPS connection). NOTE: The Satellite Monitoring Service is only available in Ultra product editions. Install a Satellite Monitoring Service on the additional servers. This is usually easiest done via Easy Deploy, though it can be installed manually as well. Once the computers have been added, add new monitors to watch the servers. You will be able to add the new monitors as though the computers they belonged to were on the local LAN -- PA File Sight takes care of everything else.